Lexus’s first compact hatch beats BMW for quality and reliability and has a gorgeous interior, but Prius mechanicals mean it's no fun to drive. The CT 200h is basically a 2009 Toyota Prius in disguise. It uses the same 1.8-litre Atkinson cycle engine (that means it alters the way the engine breathes in air to make it more efficient) backed up by a stack of nickel-cadmium batteries and an electric motor. Combined, the two power sources produced 136hp and Lexus always said that you could squeeze 78mpg out of it. Of course, you’ll struggle to do that – hybrid cars always do far, far better on the laboratory-based combined fuel consumption tests than they do on the road, so 45- to 50mpg is more like what you can expect in daily driving, although the 82g/km CO2 figure (rising to 94g/km for the sportier F Sport model with its bigger alloy wheels) will certainly future-proof you against any changes in the motor tax system. As long as you keep the speeds down and your throttle inputs gentle, it’ll be quiet too – a classic Lexus trait – but that is ruined by the CVT gearbox, which, when you ask for brisk acceleration, lets the engine rev to the heavens, creating quite a racket. Inside, the CT lacks space in the rear; the back seats and boot are really very cramped, so this is not a family friendly car (which is odd considering how roomy the closely-related Prius is). Up front though, it’s an utter joy. The quality is off-the-scale good, everything looks and feels fantastic and the seats, big and over-stuffed, are seriously comfy. Reliability-wise, you’re on a winner. Toyotas tend not to break, Lexus tend to break even less and both companies only turn their best and most talented engineers loose on the hybrid models, so do the math. There were a few recalls, so make sure those have been carried out, but basically as long as the car comes with a service history, your worries are minimal. Circa €20k will get you a well-specified Advance or Premier spec car from 2013. 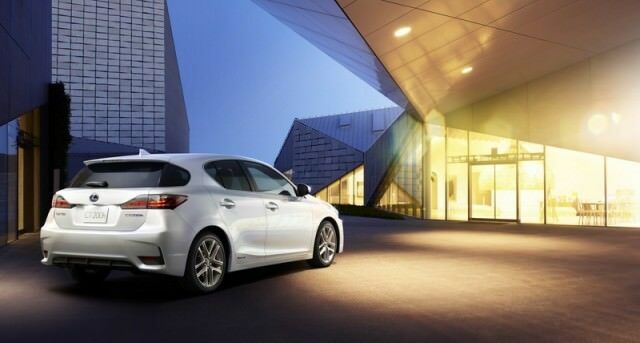 It’s a long way from being a perfect car, the Lexus CT 200h, and Toyota and Lexus hybrid technology is improving all the time, so it will soon seem obsolete. But, if you want that low, low CO2 figure, if you want near-total reliability and if you want the cabin comfort and quality of a premium brand, then it’s not a bad choice.